If you are trying to eat more veggies, you should try this Veggie Loaded Chickpea Stir Fry. It’s super easy and you can really use any veggies you have on hand. Just like vegetable broth, it’s a great way to use up leftover odds and ends in the fridge. The chickpeas add protein to make this a complete meal. You could also serve it with rice or quinoa. Toasted cashews would be a nice option too. This is vegan and gluten free and grain free! For a paleo version, you can skip the chickpeas and serve over cauliflower rice. We filmed a video for this recipe. You can view it below. For more videos, you can subscribe to my You Tube Channel. 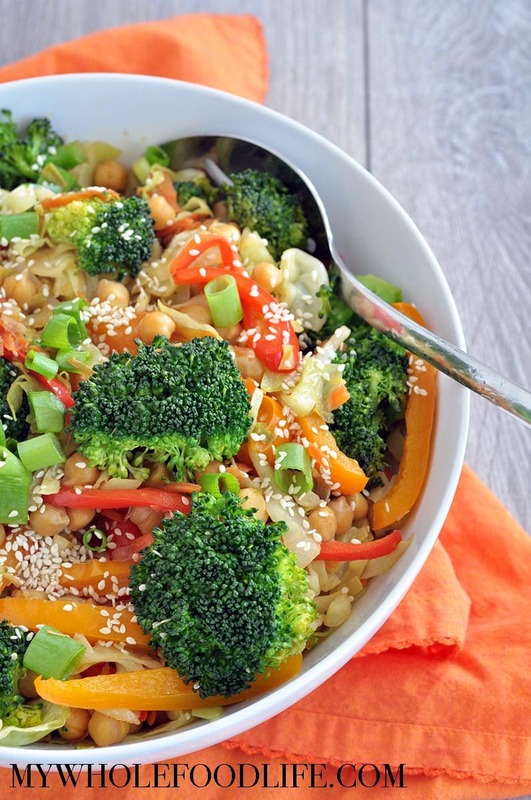 This healthy stir fry is a great way to use leftover veggies. Vegan, gluten free and grain free! Paleo option as well. In a large saute pan , on medium heat, add the oil, ginger, garlic and peppers. Stir well. Cover for 1 minute. Then add the cabbage and carrots, stir well and cover again. Next add in the chickpeas and coconut aminos. Stir well and cover for a few minutes. Lastly add broccoli and cover for another few minutes. Just to let the broccoli slightly soften. Keep this in the fridge for up to 5 days. Enjoy! Awesome idea! Simple, healthy, filling, easy on the wallet.....what more could you ask for?